Apple Inc. is one of the valuable brands on the planet. Ownership of powerful trademarks such as iPhone, iPad, Mac, and others has made Apple one of the premier intellectual property powerhouses in the world. Recently, however, Apple has been running into a few problems concerning its intellectual property or, in a few cases, lack thereof. Last year, Apple finally settled a months-long battle with China-based Proview Technology over the rights to the trademark “iPad” in China. The prolonged court battle (in which Apple had claimed that it had secured the rights through a Proview Subsidiary for $55,000 in 2009) culminated in a $60 million settlement for Proview. This week, Apple Inc.’s ever-growing IP armada was deprived of another piece of artillery. The United States Patent and Trademark office flagged Apple’s filing for the trademark “iPad mini.” The examiners found that the term was “merely descriptive” and that insufficient proof that the item was going to be used for sale was submitted with the application. The examiner, Ms. Lee-Ann Berns, did have one peculiar issue with Apple’s application. Apple submitted a screenshot as proof of use in sale; however, the examiner noted that: “The mark and picture of the goods on the specimen are not sufficiently proximate to the ‘buy now’ tab.” Luckily for Apple, the denial was just first office action and seems to be a relatively easy fix. Apple has 6 months in which to revise its application which should be more than enough time for Apple and its legal team to sort out the corrections. However, the examiner’s notes do provide some interesting food for thought. She argued that “mini” is only a descriptive adjective referring to the product and therefore it cannot be regarded as “a coherent trademark.” Berns raised an interesting argument that even though Apple already owns the rights to the iPad trademark, that the term iPad was merely descriptive: the “i” as an abbreviation of internet and “Pad” which is regularly associated with tablet computers. It should be noted that these descriptiveness objections were almost immediately withdrawn by the USPTO, but did Ms. Berns have a good point? 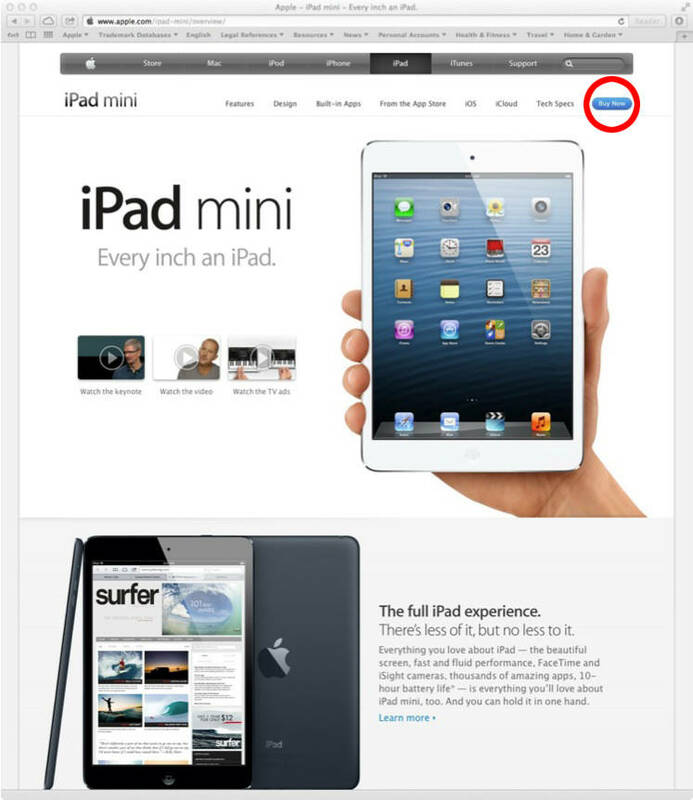 Or does Apple have a strong case that they are responsible for the word “pad” synonymous with tablet computing?